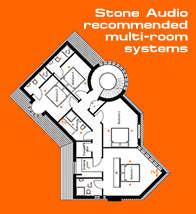 The Bardaudio system is a high end digital wireless sound distribution system from Sonneteer. Unlike other wireless systems, the Bard system is designed to be simple and with sound quality as its first priority. The Bard system uses the latest digital technology to transmit your music in the 2.4GHz band, a much higher quality system than the acient FM band, to another part of your home. As the Bard system doesn't transmit anything but music information, the full bandwidth is used exclusively for music broadcast, and without compression, for best possible sound quality. Unlike other wireless systems, the processing has been kept simple too, there are no complicated software set ups, protocols, IP address, drivers etc. using up valuable processing power... Bard's processing unit does only one thing... process the music. The ultimate in simplicity and wire free high end audio, the Bardthree solves all your wiring problems and sounds as good as your high end separates. Just plug your Bardthree module into your wall power socket connect your speakers and receive music from your Bardone or Bard USB transmitter. Your hi-fi can not only sound good but also be almost invisible. Plug the BardOne Tx into the music source be it a CD player, a radio or PC using Bard USB or via phono leads. The same size and shape as a USB computer memory stick the BardUSB could easily be mistaken for one. The difference is this one has a Bardone transmitter inside. Simply plug the BardUSB into your Computer (PC and MAC compatible). Plug the BardOne Rx into an input on your amplifier or into an active speaker system within range of the transmitter. Set both the Tx and Rx modules to the same transmit channel (up to 8 stereo to choose from). Play music from your computer and send it wire free to your existing hi-fi system(s). Enjoy the music. Well the BardOne system is a high end digital wireless sound distribution system and comes as a set, Tx and Rx which stands for transmit and receive. Plug the BardOne Tx into the music source be it a CD player, a radio or PC via phono leads. Plug the BardOne Rx into an amplifier or active speaker system within range of the transmitter. Set both the Tx and Rx modules to the same transmit channel (up to 8 stereo to choose from). Make sure everything is switched on.